Could the Orthodox Law Be a Boon for Lebanon’s Liberals? Graphic courtesy of Election Guerilla. Click to enlarge. The proposal has yet to be clarified and is unlikely to be adopted as law. 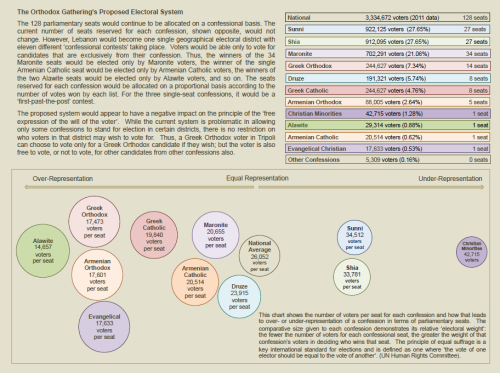 The idea is this: Lebanon votes as a single district, with each sect electing only its own candidates. Votes are tallied for the different lists, and the proportion of votes each list receives determines its number of parliamentarians. There is a problem, however, for those communities with few or no representatives. Several smaller Christian sects, for instance, compete over a single Beirut seat reserved for minorities. Most of their voters will not participate in an election that allows them but one candidate – effectively meaning disenfranchisement. If the OMG law passes, one could imagine that it may have the effect of mobilizing the many Lebanese who are passively frustrated with the confessional system into lending their support to the anti-confessional cause. It could, in other words, have the effect on Lebanon that the Syrian regime’s extension of President Lahoud’s mandate in 2004 had on the fortunes of the Lebanese anti-Syrian opposition. When one thinks back to that moment today, it’s difficult to imagine why Bashar al-Assad insisted on forcing Lahoud down Lebanon’s throats when he could have simply installed another Syrian stooge at Baabda. The extension was an act of defiance, yes, but it was also a symptom of supreme political myopia that backfired on Damascus in short order. The passage of the OMG law could easily have the same galvanizing effect on a different corner of Lebanon’s political opposition: the small but very vocal civil society sector and the much larger quotient of the Lebanese electorate that is sick and tired of Lebanon’s zu’amocracy. Under the OMG law, there will be no hiding the fact that Lebanon’s “consociational democracy” has devolved into nothing more than a constellation of sectarian communities who coexist in uneasy and suspicious alliances. The myth of inter-confessional harmony will be shattered. Furthermore, it will be impossible to mask the enormous inequalities of suffrage that are created by this law, which gives the Greek Orthodox vote twice as much weight as the Shiite vote, and Maronite voters over 1.5 times the weight of Sunni voters. One will no longer be able to disguise these inequities through gerrymandering. The OMG law will make such travesties as plain as day, and no one will be able to ignore them. Lebanon could find itself in breach of UN protocols and other conventions on human rights that require certain basic democratic principles like equality of suffrage, guarantees of the free expression of the will of the voter, etc. In other words, Lebanon’s confessional system would become a liability for its international obligations, which has often created opportunities for activists to get progressive legislation passed (as in the case of the anti-smoking ban). The Christian parties seem oblivious to and unthreatened by all of these prospects. I think they disregard them at their peril. I’m not going to restate everything I’ve written about this issue, but I think it’s worth noting that a Lebanese parliament elected on the basis of the Orthodox law is nothing more than a senate, at least as it is envisioned by most of the people who have thought about it at any length. (See here for my study of a hypothetical Lebanese senate for Stanford University’s Program on Arab Reform and Democracy [Arabic translation here]). I don’t think the creation of a senate is in the cards in 2013, but the adoption of the OMG law would make it all the easier to advocate for a bicameral system in 2017. What would be called for, in that instance, would not be a senate (because the Parliament, perhaps down-scaled in size, would effectively be a senate) but a lower house freely elected on the basis of equal suffrage and no confessional quotas. Interestingly, the main virtue of the OMG law is that it would seem to create unprecedented opportunities for reform-minded candidates to get elected. By implementing proportional representation in a single national district, the law drastically lowers the barriers to entry for candidates outside the mainstream political parties. Consider the following. There are just over 700,000 Maronite voters in Lebanon (according to the 2011 data). If we assume that we’ll see about a 50% turnout in 2013, this means that it will require just over 10,000 votes to elect one of the 34 Maronite seats in Lebanon’s parliament. That’s remarkably low, compared to previous electoral laws. Members of other sects (like the Greek Orthodox and Greek Catholics) have even better chances at snagging a seat. Under the current law, a Maronite running in Kisrawan, for example, could receive 30,000 votes and still lose the election to his opponent, who won 30,500 votes (which is generally what happened all around the country in 2009). Under the OMG law, candidates from multiple parties and alliances would share their confession’s quotient in a proportional fashion. I guess what I’m saying is that this deeply sectarian law would ironically make it possible for a small coalition of anti-sectarian candidates to get elected rather than simply complaining about the system from the outside. What’s 10,000 votes? It’s really not that many when you think about it, especially if civil society organizations, bloggers, social-networking gurus start educating people today about the opportunities to take back parliament, especially if the OMG law passes. In other news, I’m in Beirut this week, enjoying the sunshine and the shanklish, thank you very much. More soon. You know the people in charge will find a way to screw that loophole up. Lebanese parliament is a very exclusive club, and its current members would be damned to write a law that makes it easy for “outsiders” to join..
Back in the day, Ferzli used to promote this plan with a twist that would have made it a radical rethinking of the sectarian system: in addition to the plan as it now stands, create a new “non-sect” sect that people could self-select into. As people changed their voter registration to join this new sect, it would be alloted a share of MPs in direct proportion to the number of voters that it contained. Thus, in the end, people could create a non-sectarian parliament through the back door, should they choose to do so. I guess in the end the allure of pumping up the Orthodox numbers trumped Ferzli’s earlier instinct to plant a bomb in the heart of the sectarian system. My gut feeling is that it won’t pass. That said, this analysis feels overly optimistic to me — and in a big way. 1. It’s no secret today that there is already enormous inequality in the value of one’s vote. If Sunni or Shi’a groups feel that they can profit in the short-term by exacerbating that inequality, they will do it, and their partisans will largely follow. As for international obligations making a difference, this seems even less likely. What exactly are you suggesting here? The number of hybrid regimes in the international system that are nominally democratic but don’t guarantee even fair elections, much less equality of suffrage is enormous. Why would an international system that has no problems with Mubarak’s Egypt or Ba’athist Syria have a problem with sectarian Lebanon? 2. Do you really think that the same folks who would allow such an electoral law to pass would also negate its effects by allowing for another body of non-sectarian representation? They may not be wise statesmen, but they’re also not idiots. 3. I’m a little confused about the mechanics of a non-sectarian party’s candidate getting elected. Could there be a single party that puts up candidates for each sect or would the secular Maronite have to be in a different party as the secular Sunni, and secular Shi’ite? And even if there were the possibility of these secular candidates getting elected due to a lower bar, they’d still be elected as Maronites, Shi’a and Sunnis, and I suspect they would be pretty much locked in with a maximum of three seats, since none of the smaller sects could afford to lose even one seat. What would a block of three seats be able to accomplish besides breaking ties between two opposed sectarian coalitions? 1. It may not be a secret that there is inequality of suffrage, but the issue has been given a veneer of legitimacy under previous laws. The OMG law makes the discrepancies blatant, and easier to take advantage of by secularists. It wasn’t a secret that Lebanon was controlled by Syria in 2004 either, but Lahoud’s extension was seen as a bridge too far. That’s all I’m saying. With regard to international obligations, we’ve seen in a few cases that this can be a tool used by civil society to get legislation passed that wouldn’t normally happen according to Lebanon’s laws of political gravity. The anti-smoking ban? Forcing one of Lebanon’s most important industries (tourism) to kowtow to the demands of a handful of health nuts and civil society hippies? That just doesn’t happen… unless said hippies know how to work the system a little bit. 3. First of all, breaking ties is hugely important. Just ask Walid Jumblatt. Secondly, I don’t think that 3 is the maximum number of seats that are up for grabs. Theoretically, a coalition of secularist candidates (forget about a party because no such one exists) could field lists of Maronites, Sunnis, Shiites, Greek Catholics, Greek Orthodox, Druze, etc., and hope to score a single candidate here and there. With smart campaigning and a relentless social media strategy, I think it could be done. Of course, the lower bar means that many other groups are going to have the same idea. 1. Instituting a smoking ban is one thing. Challenging the fiefdoms of the political elite is something very different. I’ll believe it when I see it. 2. The pre-printed ballots and other reforms are an excellent point that is well taken. 3. Tie breaking certainly is important in Lebanese politics, but those ties are always between sectarian coalitions and (almost?) never between a sectarian coalition and meaningful secular reforms. Perhaps one could argue that such a coalition could trade a tie breaking vote on one issue in exchange for meaningful secular reform, but I suspect that such reforms would be limited to the periphery of the system (e.g. printed ballots) as opposed to reforms that threaten the heart of the confessional regime. Maybe I’m just a pessimist, but I think in order for their to be meaningful institutional reform, societal norms about identity and politics will need to be a lot different than they are now. And while I think it’s possible in some cases for societal change to come through institutional means, the heads of those institutions would need to want those changes. In situations where both society and the institutions believe in the status quo, I just don’t see much potential for meaningful change. Lots of twitter traffic aimed Qifa Nabki’s way…..